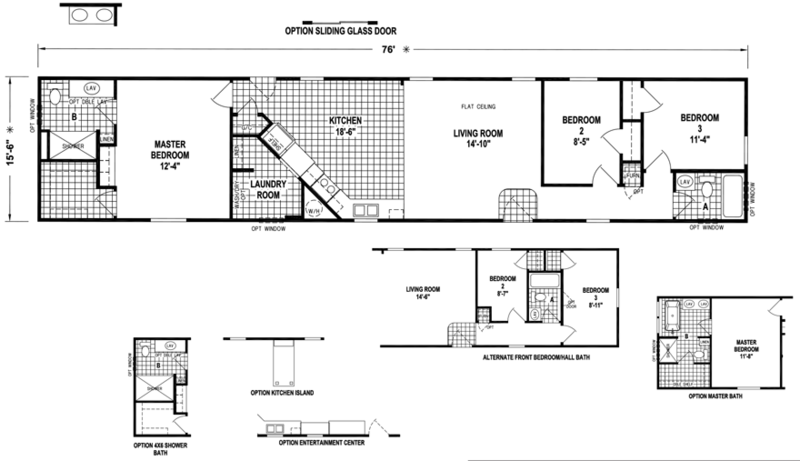 The Butler model has 3 Beds and 2 Baths. This 1178 square foot Single Wide home is available for delivery in Kansas, Missouri, Oklahoma, Arkansas & Colorado. The Butler model derives its pleasing character from its perfectly sized footprint. Not too big, yet not too small, this popular manufactured home is chock-full of high end features, chief among them a formal foyer entry and the spacious living room with cathedral ceiling. There’s a handy guest closet and broom closet included in the laundry room that is tucked away nicely behind the angled kitchen. For those looking to customize, numerous optional items are available on this home. Back elevation with horizontal Greystone vinyl siding, Extra white trim and Low E white vinyl windows. Options shown: 12″ white raised panel shutters. 9 lite white exterior door. Hitch end Elevation with horizontal Greystone vinyl siding, Extra White trim and Low E white vinyl windows. Living room – Front door entry with Mantra Truffle carpet. Zen Natural vinyl on gypsum walls. Low E white vinyl windows with Traditional Mystic window valance. Options shown: 36″ front door with sunburst window. Corbels under snack bar (decorative brackets). Kitchen – Beautiful Thermofoil White raised panel cabinets in kitchen with Bronzite countertops. Linoleum flooring in Pacific Crest Trail color. White Low E vinyl windows with White mini blinds and Traditional Mystic valance. Zen Natural vinyl on gypsum walls. Curcuit Weave Relic vinyl on gypsum accent wall. Kitchen – Beautiful Thermofoil White raised panel cabinets in kitchen with Bronzite countertops. Linoleum flooring in Pacific Crest Trail color. 18 cu ft refrigerator and 30″ deluxe electric range. Options shown: Appliance package #2 Microwave rangehood. Kitchen – Pantry doors open to hidden laundry room. Linoleum flooring in Pacific Crest Trail color. Laundry Room – Pantry area in hidden laundry room. Zen Natural vinyl on gypsum wall. Bedroom – Mantra durable cut pile carpet in Truffle color. Curcuit Weave Relic vinyl on gypsum accent wall. Bathroom – Beautiful Thermofoil White raised panel cabinets in bathroom with Bronzite countertops. Zen Natural vinyl on gypsum walls. Linoleum flooring in Pacific Crest Trail color. 1 piece fiberglass tub and shower combination. Options shown: 3.5″ Formica backsplash in Bronzite. Bedroom – Mantra durable cut pile carpet in Truffle color. Zen Natural vinyl on gypsum wall. White 6 panel doors. Bedroom – Mantra durable cut pile carpet in Truffle color. Curcuit Weave Relic vinyl on gypsum accent wall. White 6 panel door to closet. Ask your housing consultant about the other great features that come standard on the Butler manufactured home.